① Wash the rice and soak in water for at least 15 minutes. ② Dice the Satsuma imo into 1cm (little less than a half inch) cubes (Do not skin). Soak in water to remove bitterness. ③ Add the rice, water, and shiokoji to a rice cooker, and give a quick stir. Drain the potatoes and add them to the top of the rice. 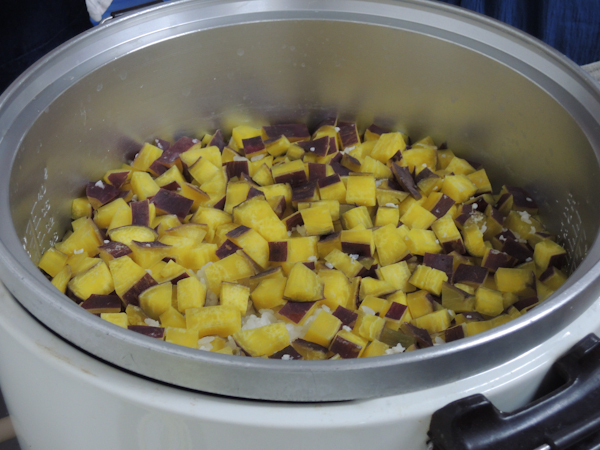 Set the cooker on “white rice” (hakumai or 白米) mode and cook. ④ When the rice is done cooking, use a shamoji (paddle-like utensil) to mix it with a cutting motion. Serve in rice bowls. ⑤ Sprinkle on black sesame.